The On-Ice Program moves from the technique stage to applying this technique at top speed while shooting, passing, stick handling and checking in game simulated drills. Good skating technique is useless to hockey players unless they can apply it in game situations. Even when players have ingrained the proper skating technique into their skating style, sometimes they will still not perform in game situations with the increased raw speed that they now possess. Usually, the problem revolves around the fact that players have not been trained to use their speed, to think, and to read the ice, all at the same time. Another problem is often players’ lack of focus and slow reaction time. In other words, players now have the “jump” to get to the puck first but they aren’t doing it because their response time is too slow when there is a turnover or a transition in the play. We have developed specific drills and training methods to help correct these deficiencies so that the transfer of their newly improved skating technique can be applied in game situations at high speed. A simple example is not using a whistle when we start our drills. In a game, players react to what they see not to what they hear. In a game, the only time a whistle is used is to stop the play. Wherever practical, we start the drills with the movement of the puck so players are constantly having to focus on the loose puck, i.e., what they see not what they hear. 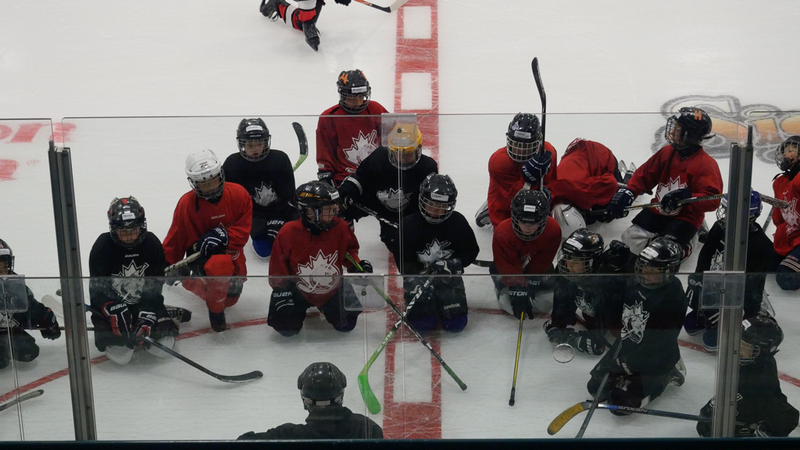 The approach on the ice is very structured, very disciplined, but fun even at the pro camps. We do not “bag skate” players because this does three things. It develops poor skating technique. It trains players to skate slowly, and, psychologically, it conditions players to “hate” skating or think of it only in terms of hard work. Our system teaches players to love skating and to love skating fast. The players will skate faster than they have ever skated before, well past their comfort zone. Our cordless mic system is interconnected with an extensive sound system so that we can “crank” the tunes up during the drills but shut it off or override the sound from any position on the ice when instruction takes place. Once players are conditioned to skating at an extremely high tempo while performing other hockey skills, that is the speed at which they will feel comfortable when they move to game situations. 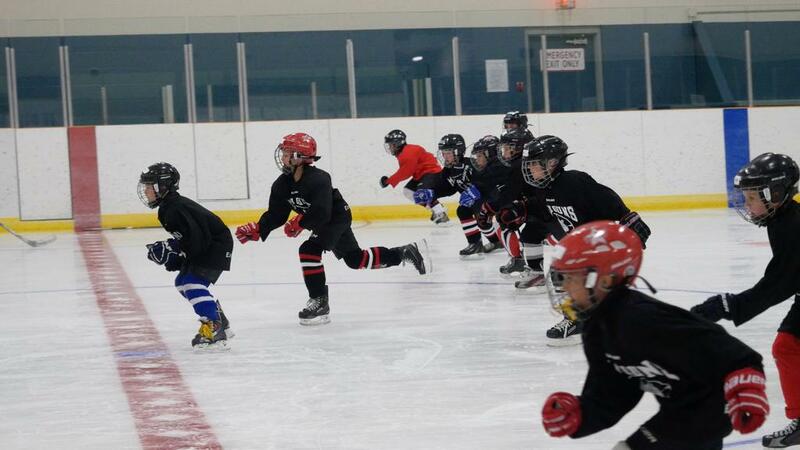 During the ice sessions we also teach players when not to use their speed in order to delay or create open ice. Computer analysis has demonstrated that the average length of time a professional hockey player skates at top speed on any occasion during a game is 2-4 seconds. It is a game of short, quick, explosive movements with an underlying need for a strong aerobic base for recovery and for speed endurance. Combined with this quickness and agility, a player must also possess tremendous strength and power in order to battle for pucks and to withstand the tough physical play. Our off-ice program addresses all of these needs. Except in the area of flexibility, we train players to do everything fast. Players have to remember that every time they train they are affecting two systems, the energy system, i.e. aerobic or anaerobic and the neuromuscular system. If we train for endurance slowly . for example, long distance running, we are at the same time training the neuromuscular system to be slow. There is no neutral. You either train yourself to be fast or you train yourself to be slow. 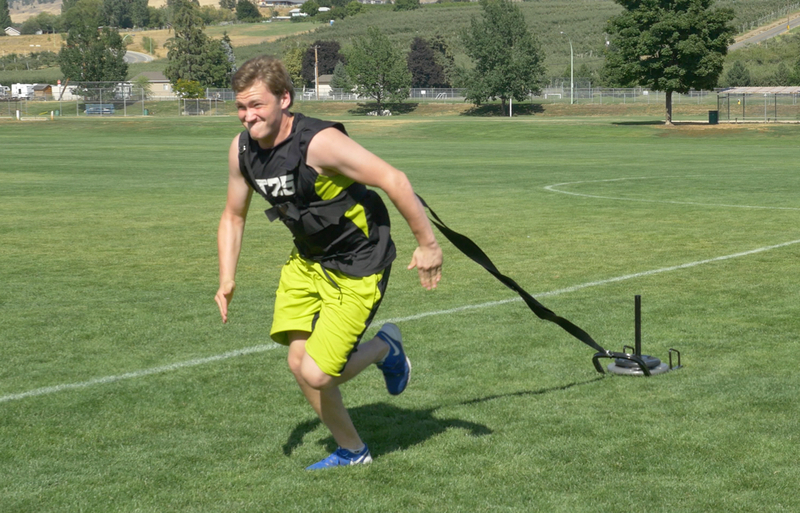 Therefore, even when we have players work on endurance we train with speed. The difference, for example, with tire sprinting would be shorter sprints with a lot of rest in between, when we are training anaerobically. When the focus is aerobic, players sprint longer distances with very little recovery time before the next sprint which enables the player to develop speed endurance. We underload the quad muscles through the use of lightning cords which permits the player’s legs to move much more quickly than they otherwise could. In this way, we try to improve the development of the fast twitch muscles fibres. We show the players methods by which they can continue this type of training after they leave the camp by doing such things as sprinting hills which have a slight decline of between 5 – 10 degrees. The players also reinforce daily the technique they have been learning on-ice through what we call simulated skating. 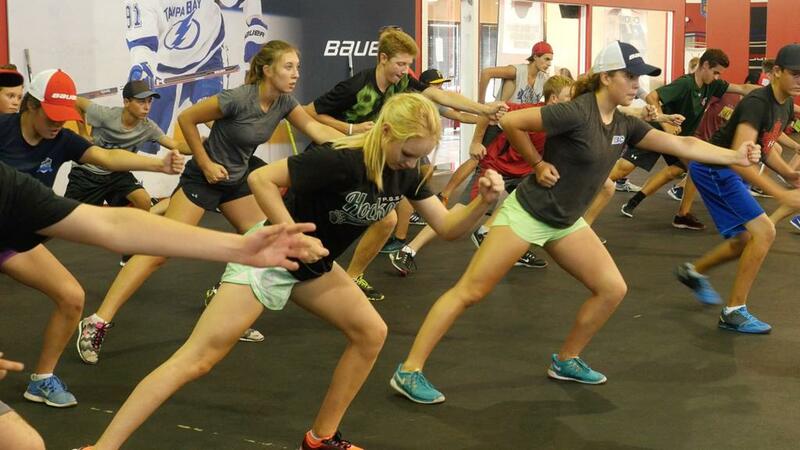 Part of the reason parents and players see such quick improvement in a short period of time is that the players each day, off-ice, are working on aspects of their skating. It might be the arm swing, the full extension, the knee bend, the foot position for quick starts, the upper body position on tight turns, etc. Once again, players are given a number of these drills to work on during the weekend. Trunk control is worked on in different ways but the main exercises involve the use of Swiss Balls. Many players have a lot of upper body movement when skating which dissipates the drive from the legs thus reducing speed and quickness. The lack of core stability in many players also reduces the effectiveness of the arm swing in thrusting the player forward. In other words, we want the players driving their legs and arms off a rock, not jelly. During the first ice session, each player is individually video-taped performing, at top speed, his or her forward skating, backward skating, quick starts, cross-unders, tight turns and stops. In the video sessions, each player's skating is reviewed and critiqued. These sessions are extremely important as they provide a relaxed setting in which a player can, for example, clearly see his high heel kick or his wide arm swing, and see, frame by frame or in slow motion, what areas of his technique are good and what areas need to be worked on. During the ensuing ice times, he can visualize in his mind what he saw and what he needs to do to correct it. Thus, the player will make those changes much more quickly in this way than he ever would by not seeing his skating and merely being told or by reading in a report card that he has a high heel kick. 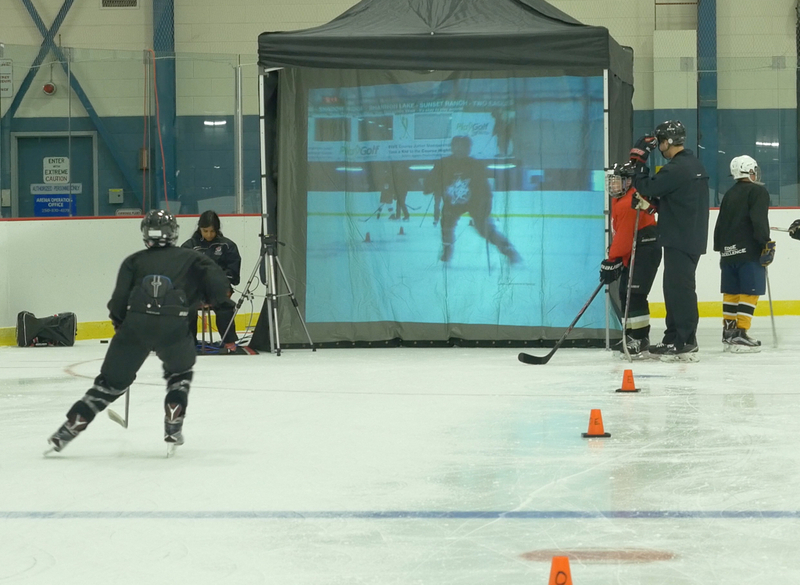 The video sessions complement the on-ice video projection. The latter technology makes it possible for the player to kinesthetically feel and see what those changes are like as the player is actually skating. As well, during the video sessions, players are shown, through computer presentation, video, and video prints, examples of the proper technique. Each player receives video of a personal analysis of their skating techique with voice-over commentary and telestrator markings for further study and review. The link to this video will be sent out shortly after camp is complete.